With way higher open rates and click-through rates, a Messenger subscriber is 5-10X more valuable than an email address. On Saturday, we launched a Facebook ad for our solar client and drove a whopping 96 high-quality leads to our client via this solar bot in under 72 hours. He spent just $196.39 in ads. With each customer worth between $2000 - $25000 - we've just generated up to $2.4 million in leads. He educates buyers, and even lets people check if they're eligible. He offers a solar calculator to allow people to see what they can save each year in electricity bills. He captures quote requests and all the details we need to provide an accurate estimate, and even pre-qualifies "when" people want to go ahead so we can prioritise quotes successfully. He answers frequently asked questions. He lets people browse through the entire product range. What has the client said? "One of the biggest things our solar bot has allowed us to do is engage with our audience without the need for a verbal conversation. Previously, I had to talk to every single prospect to answer all the questions one by one so I was limited in how many jobs I could get. Most of the time I'd have to travel to their premises to do a site inspection, then travel back and put a quote together, and I'd have to spend 4-5 hours on each prospect without knowing when they might go ahead. Now I can get prospect's details more quickly without speaking to them at all. I can size their system from my office without any travel, and get a quote to them in 15 minutes - quicker than anyone else does, which gives me a huge edge over my competition. I've done 25 quotes already this week that our bot generated, and I am visiting a client today that's an $8000 sale. It's amazing! I'm so excited about this technology and all the opportunities. I lay in bed thinking of all the possibilities." 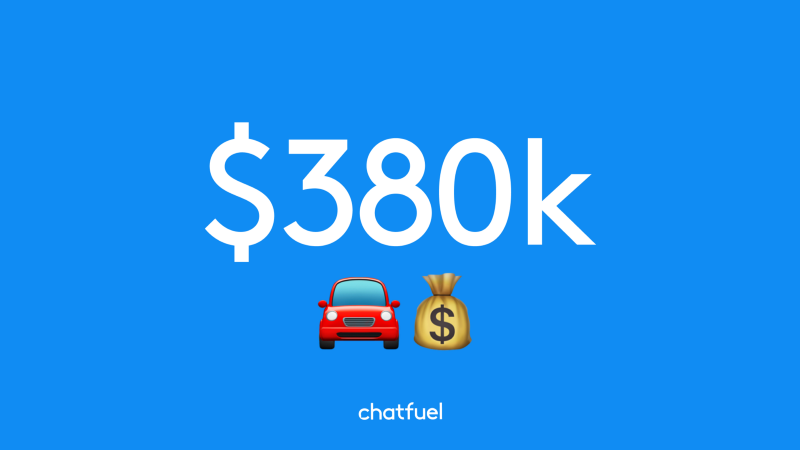 Nissan Israel Sells $380K in First Month of Launching Chatfuel Bot! Baby Brand is Generating 80% of Sales from its Bot. Cosmetic Startup Sells $250,000+ Per Month with a bot. University generated $3.1 million with 1-day campaign. Mildura Show 2018 - Their bot reached almost 2000 before the show happened! This finance chatbot reached over 28000 people, and it is getting new leads daily. This chatbot organically reached almost 2000 people for the company. This travel agency chatbot generated over $250 000 in the last couple of months. Click below to talk to a chatbot!